Do you knit? Do you sprinkle glitter on anything that isn’t breathing? Is your glue gun always loaded and ready? 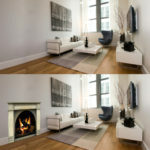 If you answered yes to any of these questions then a hand-crafted Christmas fireplace mantel is perfect for you. You do not have to be a master crafter or expert seamstress to recreate the charming and hand-made look and feel of this Christmas mantel. 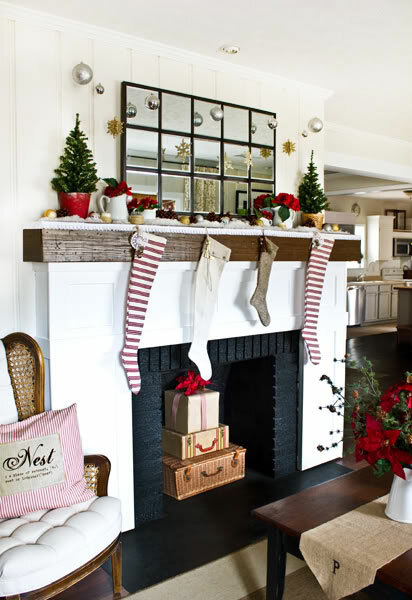 Stockings are a staple in any holiday fireplace mantel décor and are made even more special when they are lovingly hand-crafted. 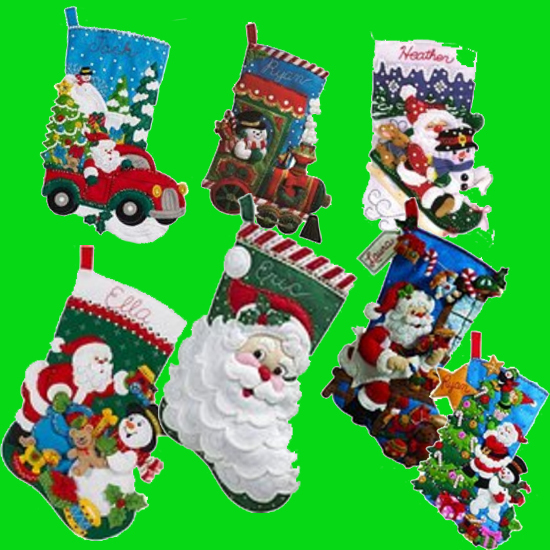 Consider starting with an applique or needlepoint Christmas stocking kit. Use a Christmas Stocking Kit to create a handmade stocking. If you can knit you can make the vintage looking red and white striped stockings or use any pattern from a Christmas Stocking Knitting Kit that you think will entice Santa Claus to fill it to the brim! 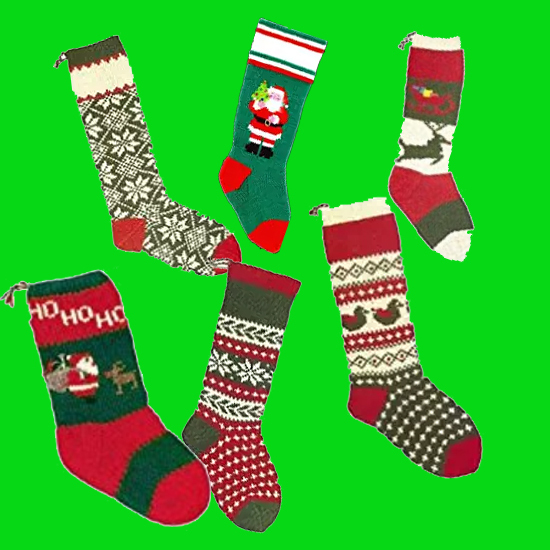 Find a knitting pattern for the Christmas stocking of your choice. For those of you who sew, or pretend to sew with the miracle we know as fabric glue, create socks out of muslin, burlap or scraps of fabric. 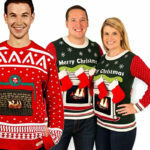 Adorn them with buttons and trinkets or hand-embroider individual names so there is no confusion come Christmas morning. Is there anything more magical than a white Christmas? I remember cutting out snowflakes from plain white paper and hanging them on the windows with tape. Take that same idea but dangle them in front of a mirror for double the pleasure. You can add glitter and even make three dimensional versions for added effect and dimension. Simply hang them with clear fishing wire to replicate the look of a snowfall. And don’t forget the fireplace tools. Add a snowflake or two to the tool set to carry the theme all the way down to the floor. Kids will love this project. Just for fun, write the name of the “artist” and add the date and see how the snowflakes improve in appearance as you pull them out each year. 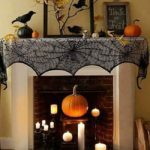 While the vintage luggage and wrapped presents are a nice way to decorate a non-working fireplace where no fireplace screen is necessary you could switch those out for a fireplace candelabra filled with glowing candles to mimic the look and feel of a fire. 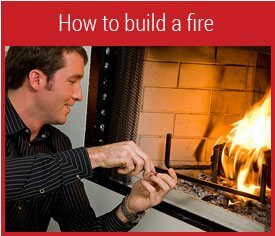 Place a fireplace screen in front to increase the feel of a real fire. 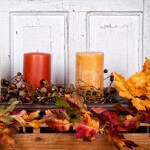 You can make your own candles, use battery operated and flameless candles or wrap traditional white candles with burlap ribbon and add a sprig of holly picked from your front yard. For safety, be sure the flame of the candle is nowhere near the ribbon or greenery and never leave a burning candle unattended, especially if little ones are snooping around the fireplace. The Christmas theme continues on this fireplace mantel with simple, small green Christmas trees placed in pots and poinsettias fill a collection of white pitchers . Painted gold and silver balls add a touch of sparkle and shine. 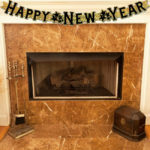 As an additional fireplace accessory and to personalize this mantel use the monogrammed table runner as a mantel scarf. A hand-crafted Christmas is a great way to use items that are readily available and to save money. Here are some good sources of how to make homemade ornaments for Christmas. More importantly, making Christmas ornaments and fireplace decorations is a great new tradition to bring the family together during the holidays…and isn’t that what it is all about?